Waterman Laureat II fountain pen from the mid 1990s. Grey marble colored lacquer with gold plated trim and black section and endpiece. Medium gold plated steel nib is smooth. Excellent condition except for a lot of pitting and corrosion on the nib, so we are calling it user grade. Manufacturer and Year Waterman, France -- circa mid-1990s. Filling System Takes long slender Waterman refills or you can fill it with bottled ink via a converter. A converter is included. Color Grey marble lacquer finish, black section and endpiece and gold plated trim. 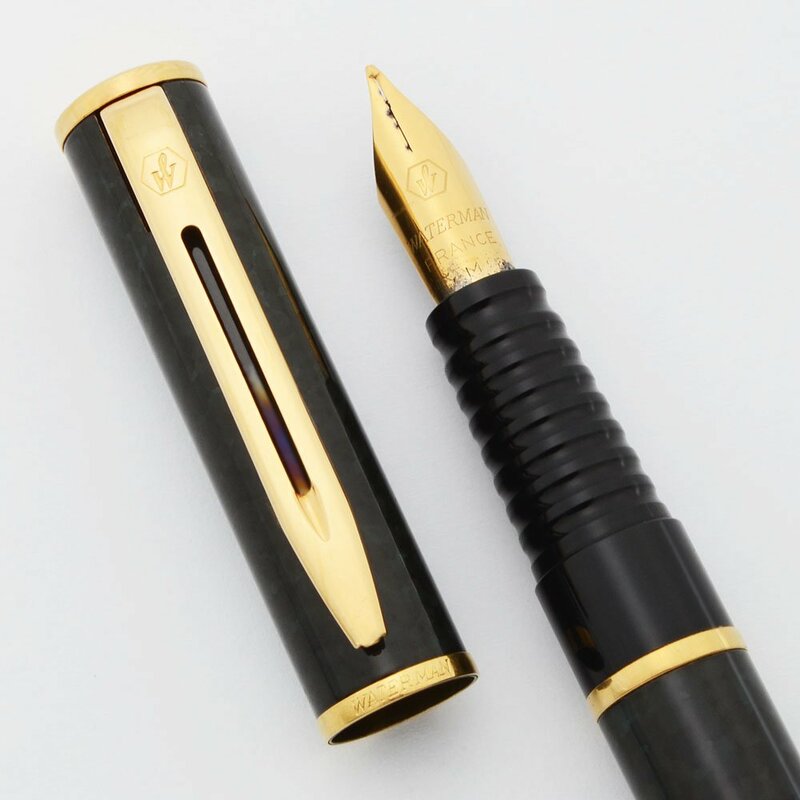 Nib MEDIUM (marked) gold plated steel nib. The nib has the common corrosion problem in the nib slit and at the base of the nib. We tested to make sure this did not affect writing. Condition Excellent condition, but we are calling it user grade due to the nib damage. The pen is shiny and the coloration and contrasting trims work very well together, creating a regal appearance. The section and barrel are quite nice with just some light scratching. The cap has scratch marks with a few deeper ones to the right of the clip. The clip has some fine scratch marks but it is shiny and pretty as is the other trim. No cracks, chips, or dings.